Do you ever feel as though you’re doing all the right things, but your business isn’t growing? Thought Leadership. Unpack your thinking. As a thought leader, you need to clearly articulate your insights and unique perspective. Add to the body of work being done in your area of expertise. Start conversations. And anticipate and answer your audience’s most pressing questions. Practice Leadership. You may be a leader in your field, but are you a leader within your own business practice? If you have staff, virtual assistants or support people, how are you leading them? How often do you touch base with them to ensure you’re on the same wavelength? It’s important you guide them and provide feedback so they can help drive your business in the right direction. Industry Leadership. To be the leader in your field, you must believe it and act like it. Make the most of every opportunity to demonstrate your industry leadership to others: keynotes, participating in industry forums, creating a LinkedIn group and writing your own book. Prioritisation. We often lament that we have no time. “There’s only one of me. I can only do so much!” But what this usually means is that we’re spending too much time on the wrong things. If you deal with all the “small stuff” first and don’t prioritise your time, you’ll lose focus of the big picture and miss the more profitable opportunities. Your Team. Too often, we try to spread ourselves too thin. To remain focused on your vision, you must manage and leverage your team effectively. What skills do they have? Are there any gaps in their capabilities? Delegate where possible and decide if you can work with a virtual team or whether you need support staff with you on the front line. Positioning. Once you unpack your thought leadership, you need to use it to its absolute potential to grow your positioning. Think once and use often. This means making the most of social media, keynotes, workshops and mentoring sessions to share your expertise and drive home your key message. This is fundamental to your sales pipeline. A lead-generation strategy will help you find new leads and clients. This isn’t about “hustling” people. Remember, being an Influencer means genuinely wanting to help people. Successful lead generation is about educating your target market – the people who would benefit the most from your services. Influence. Don’t sit back and wait for sales to magically appear. Take control over the sales process to get more clients and grow your business. People are more likely to work with someone they know, like and trust. These things are essential to having influence. So, reach out to your audience, educate them, connect with them and foster positive relationships – online and offline. Income. When you have a lead-generation strategy, your income will increase. But you also need to have a sales target. Know what you want to earn and create a strategy that details the exact steps you need to take to achieve that figure. Indicators. These are quantifiable measures that indicate whether what you’re doing is working or not. For example, the number of new e-newsletter subscribers you receive in a month, the number of people who register for your webinar, the number of social media followers you have. These give you an idea of the amount of leads and potential sales you are creating. At the intersection of Leadership and Leverage, you have the ability to amplify your area of expertise – through your thought leadership, use of time, your team and positioning. This is called platform. 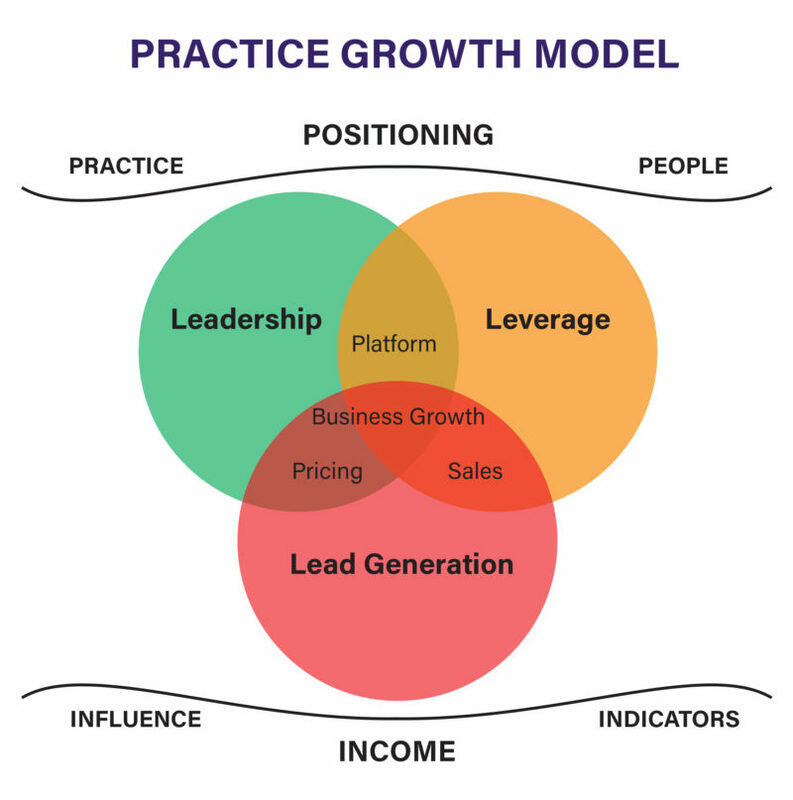 At the intersection of Leverage and Lead Generation, you increase your sales. By leveraging your team’s skills and prioritising your time, you can focus on using your positioning to reach a bigger audience and generate sales. At the intersection of Leadership and Lead Generation, you can focus on industry leadership and innovation to drive up your pricing. Effectively managing your business practice means you can spend more time contributing to your industry and bringing greater results for your clients, which leads to greater profits. So, if you’re concerned your business isn’t growing as it should, don’t simply throw your hands up in the air. By focusing on Leadership, Leverage and Lead Generation, you can see what steps you need to take to make your Influencer business a profitable and sustainable one.